Learn how to treat compression like an instrument and perform magic on any drum mix. Fab uncovers the mysterious process of parallel compression, also known as New York compression. Hear the tone differences between various compressors being pushed to their limits. 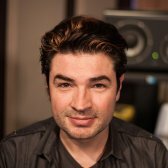 This is the most essential mixing technique that’s been used on almost every record for decades. Don’t start mixing another set of drum recordings until you’ve watched this tutorial! This video is part of our ultimate compression bundle. Check it out! What do they call French food in France? Food? I don't know! Let's go back to compression! So, first you need drums. Here's some drums! Fair enough. Now, how do we make this bigger? Simple! 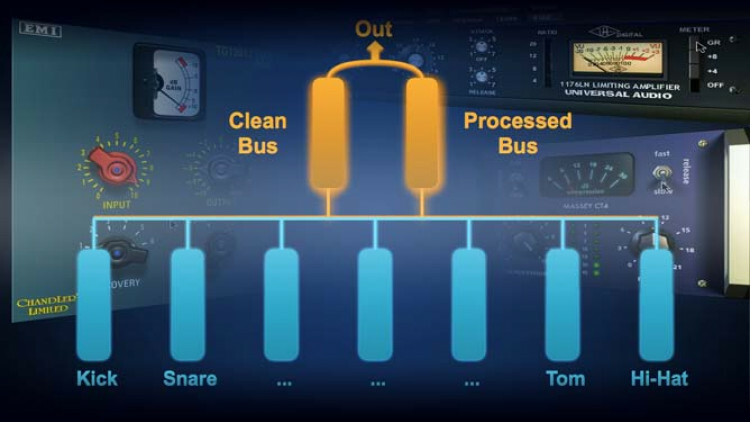 All your drum tracks must be fed to two separate busses running in parallel, meaning, at the same time and feeding the same ouputs. One of those busses will be clean the other will have an FX on it, like in our case, compression. The beauty of the idea is that you can blend the clean signal and the effected signal together however you like to create new tones. Here's how most people do it. You need two Auxes. One for your clean drums one for your crush drums. You need to send all your drums to both those Auxes. Simple enough. Let's focus on the other bus, the crush bus. I'm gonna turn it on and put a compressor on it. In this case, I'm gonna select the Massey CT4, which I think is great and especially for this, because it's simple. As a reference, this is the clean drums again. I think we could get more out of this. Let me explain the concept behind attack and release in this particular case. I have a slow attack. Why? Well, I feel the clean drums could use a little more attack. So, if on my crush bus I open the attack then the crush drum's attack is gonna get through and be louder. That's gonna enhance the clean one's. Now, I'd like more of the room, more of the buoyancy and the reality of the drums and make it more messy. To do so, I'd like to have more resonance. To do that, I'm gonna make a fast release. If I have a fast release the compressor is gonna let go quicker, right? And if it lets go quicker, what's left? Everything that's after the release is gonna get pushed up from the gain. If that's too complicated right now, look at the compression videos and then it'll make a lot of sense. slow attack, to get the transient through and fast release, so that the compressor lets go and I can hear it pump, and I can hear all the room noise come up. And it sounds like this. First, slow. Listen to the snare, and listen to the tail of the snare. And then fast, and listen to the same thing. As a reference, we started here with clean drums. And then we compressed it. lower my crush bus and then slowly raise the crush bus under the clean bus while listening, and choose a spot where I like the balance of the two. We made this bus here. And then we blended them. Just so you know, this is what it would sound like if I'd switch back to a fast attack. I'm gonna play the slow attack again. Listen to the punch and the presence of the snare. Then, I'm gonna switch to fast attack on the crush bus and listen to the same thing. It does this, right? And... that's key! So now of course, it can be overwhelming to just solo the crush bus and try to imagine what it should sound like. So how do we think about it to keep it simple? Well, you have one clean bus that keeps all the integrity of the signal transients, tone, everything. Then you have a crush bus where you can do whatever you want. Of course, it's difficult to imagine what the crush bus should sound like in solo but we have some basic principles. If your clean bus lacks punch put a compressor on the crush bus and open the attack. And then tuck that new created attack under it. If you need a lot of room, a lot of buoyancy then maybe a fast release and a lot of compression is gonna bring the room tones and then you tuck that under the clean bus and you get that. If you need both, well... slow attack, fast release, tuck it in! Those are the principles. There's a lot of stuff you can do with this. A lot more stuff. But there's a catch! Here's the catch! Obviously, we started here. I don't know many people who would not like the louder version better. which is gonna fool everybody. So far, we've been going from no parallel compression to parallel compression full bore with a big level jump. the compressed and uncompressed signals on the parallel bus, are at the same level. I'd say the compressed signal is a tiny bit louder so I'm gonna take it down a little bit. Now, I'm gonna have both busses opened. Without the level jump, obviously it's a lot less drastic of a difference but it's still a very nice enhancement, and you get the great pleasure of knowing you're not kidding yourself with levels, which is very nice. now I'd like to hear the exact same stuff but with, say a TG compressor. This TG compressor also has very few settings. There's no attack, it's fixed. 1 is the shortest one, so I'm gonna use that fast release thing. So apparently, the attack of the TG is faster than the attack on the CT4. That's why we have less punch. But it does some really cool things to the sustain of the snare. As a reference, we started here. Cool! Depending on the compressors you have available, this can turn into a lot of fun and also a gigantic time waster. or, an 1178, if they have one. Probably because somebody discovered that sound then somebody copied that sound, and that became the sound you had to have so, let's listen to that sound! I'm gonna use the UA 1176 and we're gonna use it in all-button mode meaning that you're pushing all buttons in which you're not supposed to do, but people do anyway because people do what they're not supposed to do. It's a human thing. And I'm gonna make medium attack and release. Lower the gain a little bit, and it sounds like this. I like this. It's very different from the other tubes. Let's start with the 1176. Listen to the attack on the bass drum the size of the bass drum, and the sustain on the snare. Also the grain, the little bit of distortion that having this setting provides. Now, let's listen to the TG one. Listen to the difference in grain, in sustain on the snare and also where the bass drum is placed. Listen to the punch on the bass drum, and also the sustain on the snare. Now, the three of them without talking. CT4, TG, and then 1176. Now, all completely different, all fun. The sky is the limit. You can do whatever you want. For example, you can have all three on at the same time. Check it out! I think Trent Reznor would like this one very much. To summarize, you need one clean bus for transient integrity, and tone and then one processed bus - it can be a crush bus, it can be distortion, EQs, anything you want really, it's your imagination. I urge you to download the files and try stuff. one clean sound, one processed sound run them in parallel, hence the name! Et voilà! Loved the punch from the CT4. @Sheldon Cooper: no that works but you cannot decide to alter the mix to the drum crush. It's fine in most cases. @Uauker: Phase issues can also be a benefit. If you wnt to avoid thinking baout it just have close to the same processing on both stems. If you feel confident you can stay in control when phase issues starts creating nulls and bumps then go for it. It's powerful stuff. Hey Fab! How about phases issues on parallel compression? In the mixing Caribean video you used the same compressor settings in the two busses to avoid phases issues. The same happens here? Great video fab. For me the comparison of the different sounds of the compressors was really helpful. For someone like me who is fairly new to the game and trying to train my ears this kind of stuff is great. It was very helpful at the end when you compared the sound of each compressor without talking in between the examples, and used the images to indicate which comp we were hearing. Talking in between examples makes it harder to hear the differences. It would be great if in future videos there could be more instances of this type of comparison. Thanks! I am astonished by how much difference I can hear already, in only my first attempt to use your technique. I also appreciate how you break things down in a simpler form than most which is very easy to understand. Please keep them coming! This is a great video! It definitely answered some crucial questions I've had. I really got a lot from hearing the same method used with different plug-ins too. To make a long story and a whole bunch of questions real short: 1 question: If you send your drums to 2 separate busses as in the video, doesn't that amplify your gain before you even add any processing? Stay tuned to all the really convoluted associated questions in person. Thanks Fab & G! Great great, more videos please please.. Very interesting tutorial. I like the comparisons of the different styles of compression. At times I stay away parallel processing because of various phase issues. Is there an easy way to avoid this problem altogether? Excellent, magnificent, fantastic!! It is really easy to understand but super practical. I've already learned what is "parallel compression" on another website. This video, however, is totally different. It's not just an explanation of the technique. Fab teaches how to listen to music and what part I need to focus on. And then, he shows the differences with and without parallel compression. Now.... parallel compression is my technique! This video is worth EVERY PENNY! Thanks Fab..
Wow this technique really changes my drum sounds. I feel like I just jumped up a level with my mixes. Also, when doing parallel processing, do you ever run into latency/phase issues with the two separate busses? I have a really slow LE system on my laptop, and I'm wondering if I'm going to experience that.